A bunion is a bump on the edge of your toe. It is often painful and accompanied by swelling or inflammation and redness. With time bunions can make it difficult to move your big toe and cause calluses or thick skin on your toe. It is a common misconception that tight shoes cause bunions. While shoes can cause bunion pain they do not cause bunions; bunions are hereditary. A bunion is caused by the widening of the bones in the forefoot that cause your large toe to angle towards the second toe, this results in a prominent bump. Most bunion deformities happen in the big toe joint when the first metatarsal moves away from the second metatarsal, however bunions can also be on the fifth toe and are referred to as a bunionette. Bunions usually become more painful with time and aggravation. Since bunions are hereditary there is no way to completely stop the bunion deformity. Foot structure, shapes and types are inherited and abnormal bone structure in the feet often lead to bunions. Since shoes are not the cause of bunions, they are not going to prevent you from getting a bunion. Shoes cannot stop the malformation itself, but they can trigger it. If you suspect you may be getting a bunion, there is still hope. Bunions develop slowly so taking care or your feet can have a big impact on your overall foot health. The Journal of Orthopaedic & Sports Physical Therapy says “weak muscles may play a role in bunion-related pain and movement problems”. This suggests that foot strengthening exercises can aid in bunion pain and increase mobility. If you are suffering from bunion pain do not wear high heels or pointy toe shoes. Avoid shoes that limit the movement of your toes or shoes that don’t allow room for your toes to spread when walking. Decrease the time spent standing or putting excess weight on your feet. If you suspect you have a bunion, see your doctor for a diagnosis. Your doctor should be able to pinpoint the source of your foot pain through a physical exam and X-ray. 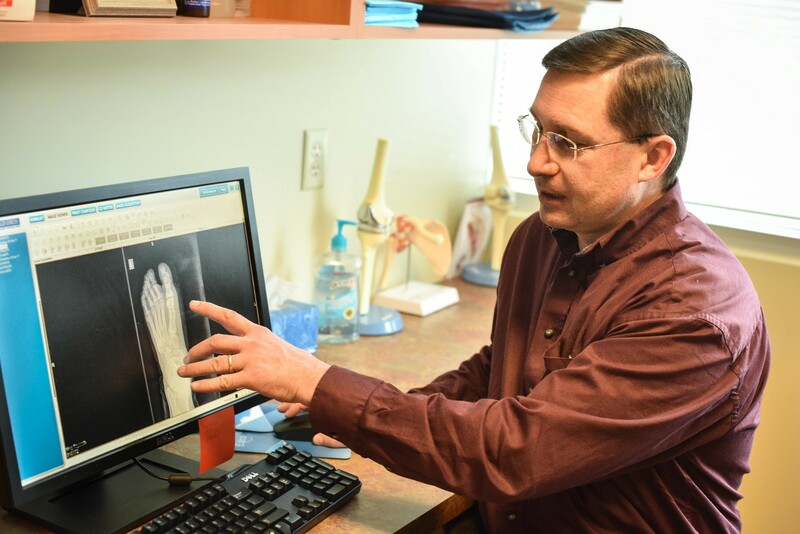 If you have a bunion your doctor can discuss surgical and nonsurgical options with you. Nonsurgical treatment can include different shoes that allow foot movement, arch support inserts or anti-inflammatory drugs, such as ibuprofen. If a bunion is left untreated it can lead to bursitis, limited movement, tenderness and swelling in other toe joints. As you compensate for your bunion and the weight is transferred from your big toe to the other toes, it can also lead to hammertoes, ingrown nails and pain in the ball of your foot. If your bunion pain persists with nonsurgical treatment your doctor may recommend a bunionectomy. Bunion surgery aims to place the toe back to its normal position, therefore restoring function by realigning the joint and removing the protruding bone. Most surgeries will take care of a bunion the first time. There is a small chance that the bunion could reoccur even though you have had surgery, however the likelihood is low. Recovery from bunion surgery can take anywhere from 6 weeks to 6 months, depending on the procedure and individual case. Talk to your doctor about your options and expected recovery time. Seek treatment immediately if your foot pain interferes with walking, physical activity or your daily routine. I think I may have a bunion forming on my foot. Just like you said, I need to go see a doctor. It’s comforting to know that there are both surgical, and non surgical options. Once I get it taken care of, I’ll be better about preventing them. Wondering if you can run on the foot normally after sugary? I play softball and would hate to give it up. Frank, you would be in a boot for about 4 weeks and the doctor would advise no running during that time. Typically, Patients are able to return to full activities and running 2 months after surgery.